Definition - What does Luteinizing Hormone (LH) mean? Luteinizing hormone (LH) is a hormone produced and released by the pituitary glands that plays an important role in the functioning of the male and female reproductive systems. In women, a monthly surge of LH triggers the release of eggs and stimulates the formation of the corpus luteum in the ovary after ovulation. In men, LH stimulates the production of testosterone that is important for the production of sperm cells and male sexual function. Abnormalities in the production or release of this hormone can lead to infertility, affecting both men and women. 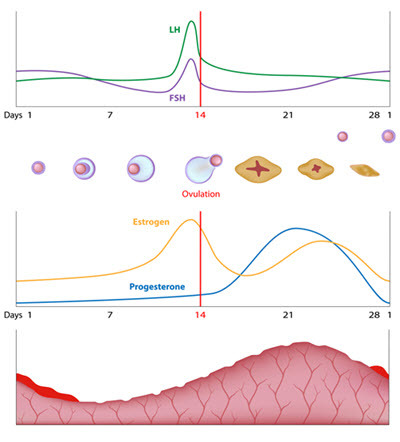 The LH levels in blood follows a characteristic pattern during the ovarian cycle in women. A surge in LH levels is immediately followed by the release of the egg from the ovary, making it a vital hormone for fertility. Luteinization, the transformation of cells that surround the egg into the corpus luteum after ovulation, is also brought about by LH. Progesterone produced by the corpus luteum is another hormone that is vital for fertility and it primarily aids implantation of the fertilized embryo. In men, LH triggers the production of testosterone in the testes, and testosterone is necessary for the normal development of sperm. Gonadotropin-releasing hormone (GnRH) released by the hypothalamus regulates the production and release of LH hormone from the pituitary. Defects in any of the steps involved in LH release can lead to infertility both in men and women. Examples are pituitary and hypothalamic disorders, eating disorders like anorexia nervosa, and excess prolactin production. Drugs such as birth control pills or clomiphene can also interfere with the release of LH. Levels of LH may be monitored to assess fertility in both men and women. In women, LH levels can be used to assess ovarian reserve or to time the fertile window on a monthly basis (because a surge of LH triggers ovulation) through ovulation predictor kits. Prior to measurement of blood LH levels, any drug that could affect LH level should be discontinued. LH may be administered to women to increase ovulation or improve the timing and quality of ovulation, and to men to increase sperm production when indicated.